In one very specific sense, Shades of Blue is a lot like Hannibal. One of the initial reasons it stands out is due to the network its on. In other words, this doesn't immediately feel like a show that necessarily wants to be on NBC in 2015. Now that's not really something the show itself has to somehow find a way to deal with. But whereas Bryan Fuller's visually sumptuous, bloody marvel immediately distinguished itself beyond the oddity of a ready-for-cable-drama finding its way into the primetime lineup of the peacock network, this new dirty cop drama, for all its movie stars doing their TV-detective thing and Academy Award-winning director helming the first two episodes, does little more than rely on the wattage of said stars to distinguish itself. 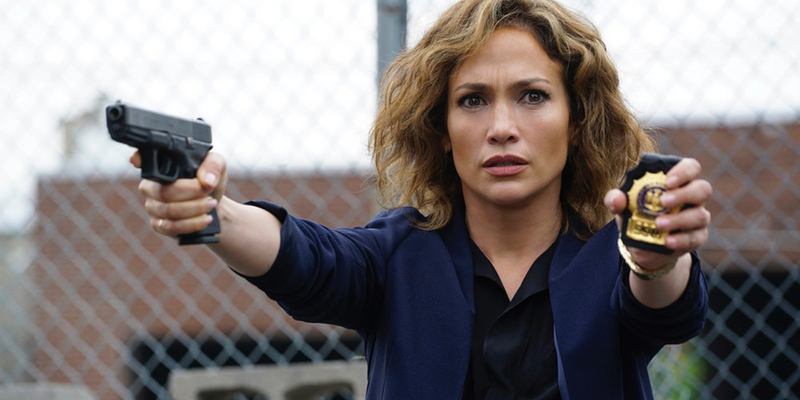 The series stars Jennifer Lopez as Det. Harlee Santos, a Brooklyn cop and single mother who is also part of a "crew" led by Lt. Matt Wozniak (Ray Liotta), running a racket collecting kickbacks and protection money from local crooks to line their pockets – being a single parent in Brooklyn isn't cheap. And, as Wozniak attempts to explain to a gangster headquartered in a funeral home, before liberally dusting the crook's face with some poor saps ashes, it's all rationalized as "keeping the neighborhood safe." All is going more or less according to plan until FBI agent Robert Stahl (Warren Kole) busts Harlee with an undercover sting operation and proposes an impossible choice: help the Bureau bring down Wozniak and the rest of his crew, or, you know, go to prison. It's at that point Harlee demonstrates what could have been an asset to Shades of Blue. She tells Stahl he would be better served going after the sort of cops who are making things worse, rather than crews like Wozniak's that are breaking the rules, but, according to them, make the streets a safer place in the process. It doesn't really matter whether the audience sees Harlee's justification as reasonable or even true. What matters is that the character has a point of view about her situation – the one she was in prior to being caught red-handed. It's a justification that likely helps her sleep a little better at night and that helps color the character to a certain degree, especially since, being the protagonist and all, the show would probably like the audience to have the faintest glimmer of sympathy for Det. Santos, as her situation goes from her breaking bad to much, much worse. At the very least, Harlee's justification makes her relatable enough. But the stance she takes on her extracurricular activities is the show's biggest idea. Or it would be if Shades of Blue chose to do anything with that familiar little nugget, no matter how many times it's been used before. But the show doesn't take that idea (or any idea, really) and run anywhere with it – at least not in the pilot, anyway. Instead, the show sets its sights on setting up the high wire across which Lopez's character will be precariously walking for the next 12 weeks. There is a whiff of perfunctoriness in the set-up that Shades of Blue cannot avoid, largely because it doesn't quite know how to pin down the character of Harlee and how the character should be viewed. The series begins with rookie Michael Loman (David Okeniyi) shooting an unarmed man after mistaking the sound of gunfire from a video game for the real McCoy (a thin plot device made worse by the fact that the show doesn't even touch on this as an issue; it barely acknowledges the dead man in the room). Harlee doesn't break a sweat crafting a narrative to protect her fellow detective – which involves shooting him (in his protective vest) to add that extra layer of believability to their story. The moment suggests Harlee's been doing this for so long it's become reflexive, and Lopez's confidence in revealing that reflexivity is compelling, initially. But where the series slips up, and muddies Harlee in the process, is in the diminishment of the sense the character's ability to choose. Harlee made a choice a long time ago that led to the situation she's now in, but even then, the series suggests it was a reaction to overwhelming circumstances (i.e., single mother who wants a better life for her child). Harlee's discussion with her young partner and his completely involuntary inclusion into a group that doles out its plunder in a bar's backroom refrigerator hints this is how things are done, this is how dirty (but still, deep down in their minds, really good cops) are born. For what this show seems to want to be, positioning Harlee as morally ambiguous (but not, really), having to constantly react, and having been roped into unsustainable situations by supporting characters like Wozniak and Stahl, instead of building them herself, feels like a disservice to the protagonist. Good performances and filmmaking aside, this brings things back to the first issue: that Shades of Blue doesn't quite belong here, but, then again, there's not really a good answer where it does belong – besides, maybe, going head-to-head with NYPD Blue or following director Barry Levinson's work on the acclaimed Homicide: Life on the Street in a weird one-two punch of gritty truth-seeking cops and glossy corrupt cops. In other words, this show might've been gangbusters 15 or 20 years ago, but now it feels like it's walking in the blue-tinted shade of greater police dramas both on cable and off. Shades of Blue continues next Thursday with 'Original Sin' @10pm on NBC.